4th Light Horse Field Ambulance Shoulder Patch. The 4th Light Horse Field Ambulance was formed in February 1917 from some 60 men drawn out of all the other Light Horse formations in Egypt. In January 1917, it was decided to split the Australian and New Zealand Mounted Division (Anzac MD) into two division, the new Anzac Mounted Division and a new division called the Imperial Mounted Division. At the core of the new Imperial Mounted Division was the Australian 3rd Light Horse Brigade which was attached to the original division and the British Yeomanry formation, the 5th Mounted Division. One new Australian Light Horse Brigade was formed from the existing Camel Regiments [See: Imperial Camel Corps - units] which was re-named the 4th Light Horse Brigade. This was the reformation of an original 4th Australian Light Horse Brigade, 1915 which was disbanded in 1915 upon arrival at Gallipoli as reinforcements. 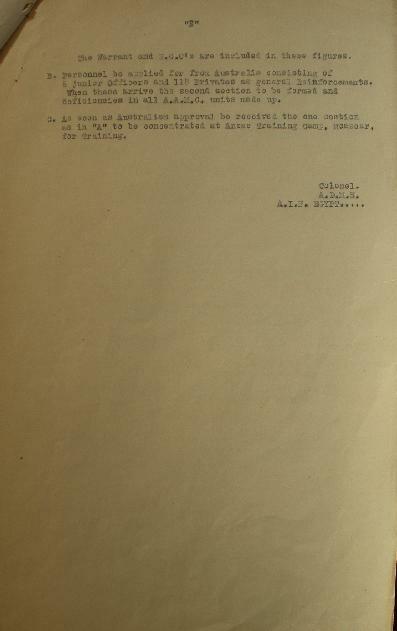 4th LHFA Formation Instructions, 31 Janaury 1917, p.1. 1. As there is no reserve of Medical Officers of rank and file in this country, the intention is to form only one section at present, but this section will have 5 Officers; when personnel arrive from Australia the Ambulance will be brought up to strength. 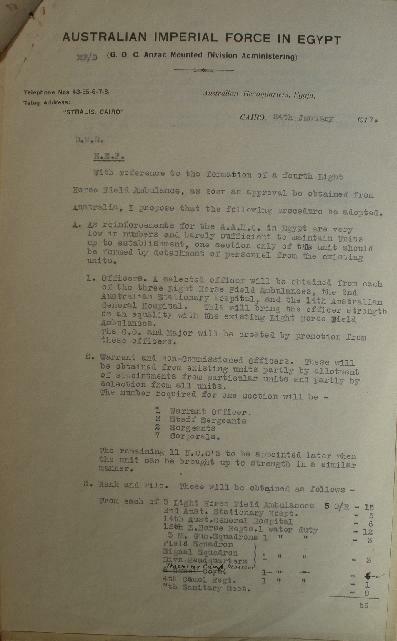 For the first section it will be necessary to call on existing units for some of their personnel thus bringing them temporarily below establishment; the necessity for this is regretted bu I rely on the good feeling and spirit of fair play in commanding officers not to send their worst men to the new unit but to allow their drasft to be a fair average of their whole unit. These men will not be struck of the strength of the present units until their usefulness in the new unit has been ascertained. A definite period of probation will be fixed later. Men who can ride are preferable and unless a sufficiency can pass the riding test the non riders will be returned to their units and others called for in their places. 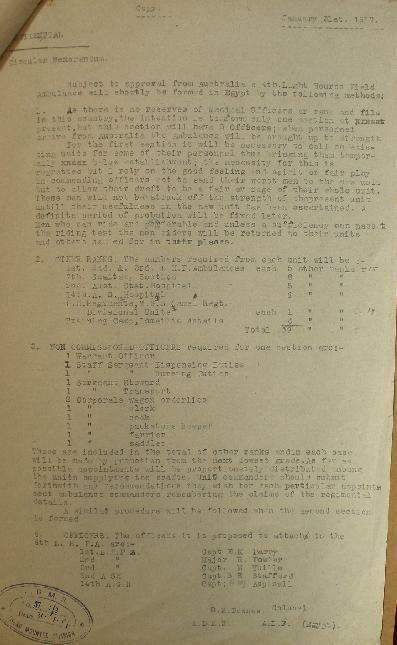 To allow the gazetting of the new formation with the prescribed ration strength, orders were issued from AIF Headquarters in Egypt on 24 January 1917 to commence the process of formation. Below is a copy of that letter. 4th LHFA Formation Order, 24 Janaury 1917, p.1. 4th LHFA Formation Order, 24 Janaury 1917, p.2. The acknowledgement of low reinforcements to the Australian Army Medical Corps was indicative of the general manpower problems faced by the AIF as support for the war waned in Australia. To compensate for this, supplying the necessary manpower meant stripping members from existing formations. This included both officers and men. Total Composition of the 4th LHFA = 59 Other Ranks. The process of assembling the 4th LHFA was finalised by early February 1917. 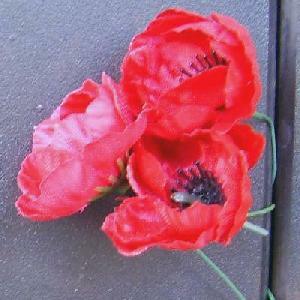 The Roll of Honour contains the names of all the men known to have served at one time with the 4th Light Horse Field Ambulance and gave their lives in service of Australia, whether as part of the 4th Light Horse Field Ambulance or another unit. Henry James BARTLETT, Died of Disease, 28 October 1918 . Frederic Michael CARNEY, Killed in Action, 31 October 1917. Norman Allen CHALLIS, Killed in Action, 31 October 1917. Lawrence Leslie FLOYD, Died of Disease, 8 March 1918 . Cecil FOULIS, Died of Disease, 20 August 1915 . Peter HAMILTON, Died of Accident, 15 May 1919 . Sydney Moor LAKE, Killed in Action, 31 October 1917. Norman Edward Johnson SCHMIDT, Killed in Action, 31 October 1917. 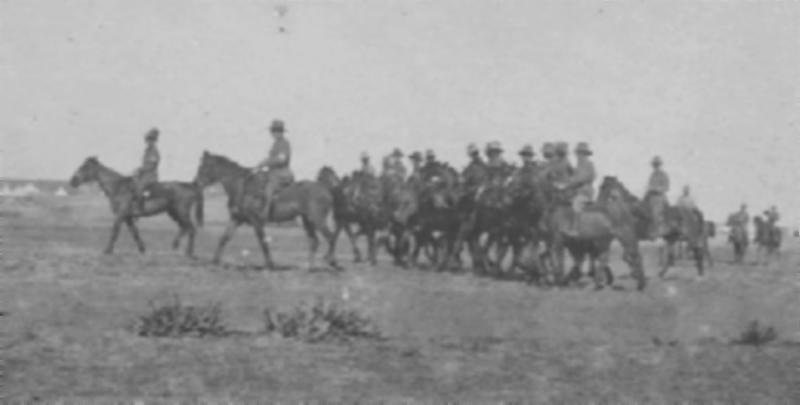 Lieutenant Colonel Clive Vallack Single produced a unit history of the 4th Light Horse Field Ambulance, AIF, in which included a section specifically related to the battle of Beersheba and extracted below. The Mobile Section of the Ambulance left Fara at 1700 on October 28 and travelled with the Brigade to Esani. this constituted the first night's march. Here we halted and bivouacked till 1830 on the following day, when the journey was resumed to Khalasa, which was the second bivouac site. During the night's march strict discipline was maintained. Smoking or talking was not permitted. The weather was ideal for travelling. The white chalk and sandstone cliffs between Esani and Khalasa stood out conspicuously in the moonlight, and presented a picture of exquisite grandeur. As the columns moved onwards all hearts were gay, and in each face could be discerned an appearance of eagerness for contact with the enemy. The past six months of quiescence were monotonous for most men, and now that operations were to commence, all were keen and alert in anticipation of striking a severe blow on the enemy who had repulsed two assaults on Gaza earlier in the year. The Brigade moved from Khalasa at 1700 on October 30. As the columns left the bivouac area, the moon rose from behind the Eastern Hills and the journey throughout the night was made with no difficulty than would have been experienced if travelling had been by day. On arriving at Asluj at 0200, it was found that the Australian Receiving Station was utilising a brick building there as a hospital. After halting an hour at Asluj the troops moved on, and journeyed till 1130 on October 31, arriving at Iswaiwin. Here we off saddled, and rested till 1630. It was then time to move again. It was not clearly apparent to all that the attack would be made on Beersheba that night. Two officers with all the sand carts and bearers travelled in the rear of the Brigade which immediately  took up positions behind the hills to the East of Beersheba. The Tent division of the Ambulance did not go with the Brigade, but travelled northwards towards Khashim Zanna, where the Dressing Station was established pursuant to instructions from ADMS, Ausdiv. The attack was launched at 1900 and it was only a matter of minutes before Beersheba was entirely in our hands. Casualties commenced to arrive at 2100. The bearers and sand carts travelled backward and forwards between the battle-field and Dressing Station till 0400 November 1. Forty-six Australian patients were treated and as most of the wounds were severe, the dressing staff was kept working continuously without any respite. When all patients had been dressed and fed, most of the staff went to bed. At 0600, however, hostile aircraft bombed the Station but no damage was done. As soon as the Receiving Stations received the news of the fall of Beersheba, they left Asluj for the captured town in accordance with pre-arranged plans. Here they occupied the Turkish Hospital which was in a dirty condition and infested with vermin. This building was considered unsuitable for the reception of patients, so with as little delay as possible, the Station established itself in the Town Hall. At 1100 on November 1 the patients at Khashim Zanna were evacuated to the Australian Receiving Station at Beersheba and five men who had died of wounds in the Ambulance were conveyed by cacolet camels to Beersheba for interment in the Military Cemetery there. Having cleared the Dressing Station of patients, the Ambulance moved on to Beersheba and occupied a camp-site in the Brigade area to the East of the town. The horses were watered and tents pitched. Just as the animals returned from water, the attention  of the men of the unit was attracted by the MG Squadron opening up fire. On looking skywards an enemy plane, flying very low, was seen approaching the Ambulance. All dived to the ground for shelter but it was then too late. The enemy had dropped his bomb in the midst of the bearer lines. The thunderous explosion was followed by an appalling spectacle. The horse lines were strewn with the intestines of eviscerated animals, and in the midst of this scene were lying many of our own personnel. Some had their limbs shattered, whilst others had their chest and abdomen torn away. Here and there were horses limping away on three legs. The scene was simply indescribable. The casualties were four killed and eight wounded, whilst 14 animals were also killed or had to be destroyed. These were the first casualties that were suffered since the inception of the Ambulance. The deceased soldiers were all buried in a gum tree plantation which was set apart from the Military Cemetery. The following is a composite alphabetical roll of all members of 1st Light Horse Field Ambulance, AIF who are known to have embarked overseas during the Great War. William John Rupertswood Brauchie HILE.